Tansy and rue are two of my best warriors for integrated pest management. Great Lakes Permaculture > Gardens > Tansy and rue are two of my best warriors for integrated pest management. When using integrated pest management techniques within your garden, you always want to have multiple options in case one fails. I have found two plants that can provide many benefits with little care needed; they are tansy (Tanacetum vulgare) and rue (Ruta graveolens). Tansy has small button like flowers. Rue has blue green leaves. 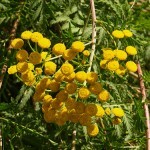 Tansy is a flowering herbaceous plant with finely divided compound leaves and yellow, button-like flowers. It has a sturdy, somewhat reddish, erect stem, usually smooth, two to three foot tall, and branching near the top. The leaves are alternate; three eights to five eights long and are pinnately lobed, giving the leaf a some what fernlike appearance. The round flat-topped, button-like, yellow flower heads are produced in terminal clusters from mid-to-late summer. The scent is similar to that of camphor with hints of rosemary. Tansy is very easy to grow by seed or root division; the Ohio Master Gardeners consider this to be a non-native introduced species indigenous to Europe with are a few states in the west parts of the United States that have placed this plant on their invasive plant list. I use Tansy for its ability to repel flies and beetles; tansy has a long history for this purpose dating back to the middle ages. Dehydrated tansy was among the ‘strewing herbs’ that were scattered on the floors with a view to keep pests away. In addition, housewives also dangled dried tansy plants from the rafters, placed them between bed sheets as well as mattresses, and also rubbed the herb on meat to keep flies and lice away due to the lack of refrigeration at that time. Recently people have employed tansy to fend off moths and dispose of fleas. Tansy is a long lasting herb, able to withstand the harsh Ohio winters, still blooming well after the first hard frost. The very name tansy is an altered form of the Greek expression ‘athanasia’ which denoting immortality. Tansy also has medical, culinary, and crafting uses. Tansy cakes were made and consumed during lent, the bitter cakes were meant to remind us of the suffering of Christ. Herbal leaf teas were consumed to cure stomach ailments, colds and to flush out intestinal worms. A poultice can be made from the aerial parts to cure cuts or bruises by promoting rapid healing of the subject area. Caution must be used with this herb if taken internally due to the inherent strength of this herb; seek a professional herbalist’s advice before using this herb to insure safety. Small amounts of the tender leaves of this plant may also be added to salads. 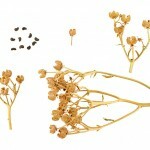 Tansy is also made use of in the form of a flavoring, substituted for cinnamon and nutmeg. The leaves as well as the flowering stems of this herb are also used to prepare an astringent and slightly lemon flavored tea. For the crafters, the young shoots of tansy yield a green dye with the leaves as well as the flowers of this herb providing a yellow dye. This is a very versatile but widely forgotten herb which bears much research; I have barely scratched the surface of the history and uses for this herb. But we must move on to my second warrior, the rue plant. The rue plant has a very colorful history which I found fascinating, today I use it to ward off unwanted insects within the garden, I have found to be particularly effective in repelling Japanese beetles, aphids, flea beetles, flies, slugs and snails. If you place a small bouquet of rue indoors it will repel common fruit flies. 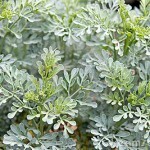 Rue is a hardy evergreen somewhat shrubby plant that is a native of Europe. The stem is woody in the lower part; the leaves are alternate, bluish-green, bi- or tripinnate, emitting a powerful disagreeable odor and have an exceedingly bitter acrid and nauseous taste. The greenish-yellow flowers are in terminal panicles, blossoming from June to early October. The history of the plant is what gave me the clue on the common uses within my garden, during the Middle Ages whenever the rich went outdoors; they took along with them a small bouquet of the rue flowers to wade off the lice of vagabonds and beggars. During the 18th century, bouquets of the rue flowers adorned the courts of law to neutralize the germs and harmful insects carried by the prisoners on their selves. 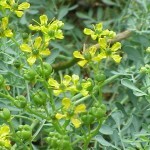 Regarding medicinal the benefits of rue, older herbal texts claimed many uses for this odoriferous herb. But the many claims are so ridiculous and unsubstantiated; they cannot be used for any reference in modern day medicine. Consult a licensed herbal practitioner before using internally, but as you can see I have found uses for it within the garden which fit perfectly. Using the tansy and rue plant have become a common site around the drip line of my fruit trees to ward off harmful insects, with sufficient plants now I will also be adding the cut stems to the walking paths as a repellant during the growing season. Care should be exercised in the handling of this herb as it can cause skin irritations when combined with direct sunlight in some cases. Consider the team of tansy and rue during your spring garden planning.